After nearly a month-long battle, at times vicious, Bihar has made its decision. Derailing the strong opposition juggernaut powered by Prime Minister Narendra Modi himself, Nitish Kumar rode home to victory with allies Lalu Prasad Yadav's Rashtriya Janata Dal and the Congress. The loss comes a strong blow to the BJP, especially party president Amit Shah who had been confident of the lotus blooming in Bihar. The first nail in BJP's cofin was struck by Rashtriya Swayamsevak Sangh chief Mohan Bhagvat, who in an interview to The Organiser, said that reservations have been for years used as a political tool and suggested that a "non-political" committee be set up to examine who needs the benefit of reservation and for how long. The opposition, especially Lalu, latched on to the remarks and used it to rally the support of the backward castes who draw benefits from affirmative action. Even though the BJP later clarified that it very firmly supported the constitutional reservation for the SC, ST, OBC, Backwards and Extremely Backwards classes, the damage had already been done. One of the biggest reasons why the BJP failed to connect with the electorate was perhaps the lack of a face. All along, the BJP made the campaign a fight between Narendra Modi and the Mahagathbandhan of Nitish, Lalu and the Congress. The party refused to project a chief ministerial candidate, fearing of a caste backlash. However, there its list of potential leaders for the CM post kept swelling. Congressman Mani Shankar Aiyar summed it this way: "In a state election, you need state leaders. You need local faces to win elections in states. State face is very important. By fielding a wrong face, that too Prime Minister Narendra Modi, they lost it." Did the BJP dare to question the 'Bihari DNA' and hope to get away with it? Nitish Kumar effectively snatched the initiative from the BJP's campaign when he went hammer and tongs over Prime Minister Narendra Modi's remarks about his DNA during his first rally in Muzaffarpur on July 25. Bihar BJP leader Sushil Modi went a step further and said that it is 'ridiculous that Nitish Kumar who has betrayal and arrogance in his DNA is trying to epitomise himself as Bihar'. Nitish used the DNA issue to the hilt, even arranging to send over 25 lakh DNA samples to the Prime Minister's Office. He repeatedly kept the issue alive, even speaking on it on the last day of campaigning for the five and final phase of polling. It seems Nitish's strategy to pull off the Bihari asmita sentiment has paid dividends. All through his campaign schedule, Modi maintained a stoic silence over the rising instances of intolerance in the country. While he fleetingly delved on the Dadri killing issue during one of his speeches, he remained mum on the utterances of his party leaders. The issue of intolerance dominated the national debate during the five-phase elections in Bihar with a large number of artists, writers and others returning their awards to protest against what they called an 'atmosphere of rising intolerance' in the country. This could have led many fence-sitters, who would have otherwise voted for the BJP based on its development agenda, decided to switch loyalties. The biggest factor, perhaps, why the lotus couldn't bloom in Bihar is the Mahagathbandhan itself. The alliance of two of the biggest parties in the state acted as a wall that kept the 'Modi wave' from sweeping through the state. The grand alliance withstood the turmoil within over seat sharing that saw Mulayam Singh Yadav's Samajwadi Party walking out. Together, the 'secular' alliance negated the impact Modi may have had on the electorate. The next question though is inevitable -- Can the Mahagathbandhan stick together for five years? 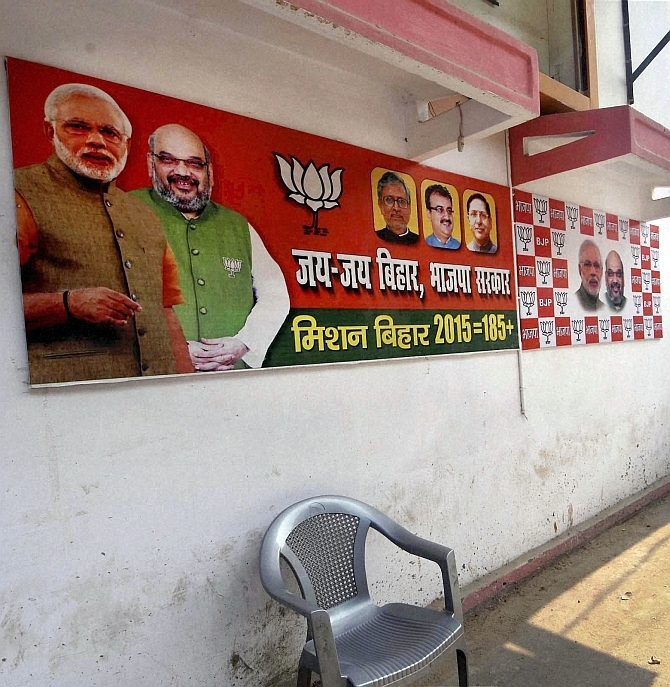 Why 'Modi wave' failed to resonate Bihar?